Get the kids in on the St. Patrick’s Day action and whip up these delightfully green treats (pistachio! mint chocolate chip! 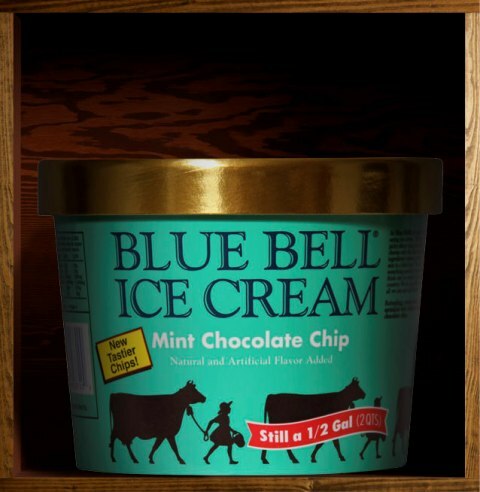 ), courtesy of Blue Bell Ice Cream. Place the muffin cups into each muffin mold of a 12-count muffin tin. Have an adult help you prepare the brownie mix according to the package directions. Pour an equal amount of mix into each 12 cups. Have an adult bake the brownies using the recommended temperature, but reduce the time to at least ½ of the recommended time (Time will vary—check for doneness according to package directions). Cool brownies completely. Place one scoop of ice cream on top of each brownie. Use enough ice cream to fill the muffin cup, rounding the top of the ice cream to resemble a cupcake. Place the “cupcakes” on a tray, cover with foil and freeze for 2-4 hours. Just before serving, remove the cupcakes from the freezer. Spread enough icing on the cupcake to cover the ice cream. If you don’t want a big mess, remove the foil cup and serve the cupcake in a dessert dish with a spoon. Otherwise, serve as is and have fun. Makes 12 servings. Gently twist apart each crème-filled cookie, keeping the separated cookies paired together. Working quickly and using a sturdy small spoon, scoop a rounded teaspoon of ice cream and place it on the crème side of one cookie. Replace the other side of the crème cookie on top of the ice cream to make a small ice cream/crème-stuffed sandwich. Place sandwiches on a small tray and cover with foil. Freeze for 1 to 24 hours. Remove from the freezer and serve individually (Makes 12 servings) or stack 3 sandwiches haphazardly on a dessert plate. Add a dollop of whipped topping and drizzle with chocolate sauce (Makes 4 servings). Spread 1 pint of the ice cream in pie crust. Sprinkle 1 cup of the crushed cookies over ice cream. Cover and freeze 1 hour. Spread remaining pint of ice cream over cookies. Cover and freeze 1 hour. Decorate top of pie with whipped topping and remaining cookies. Freeze uncovered about 2 hours or until firm. Let stand at room temperature about 10 minutes before cutting. Cover and freeze any remaining pie. Yield one 9-inch pie. Preheat oven to 350 degrees. Blend Oleo, 1 cup almonds and flour well. Pat firmly into pie dish and bake for 20 minutes or until slightly brown. Put ice cream into a large bowl and let melt completely. Pour ice cream into baked shell and let freeze until firm. Before serving, spread Cool Whip over cake and sprinkle with chopped almonds. Spread 11/2 cups crumbs in bottom of 9”x13” pan. Melt butter and chocolate together over low heat in heavy pan or in double boiler, cooking slowly and stirring constantly until mixture boils. Stir in sugar, eggs and nuts. Add vanilla. Pour mixture over crumbs in pan. Chill. Spoon softened ice cream over chocolate. Sprinkle remaining crumbs over top of ice cream. Put in freezer. Cut into squares to serve. Makes 20 servings. I grew up on mint chocolate-chip ice cream. Yummy. the Pistachio Delight sounds awesome.